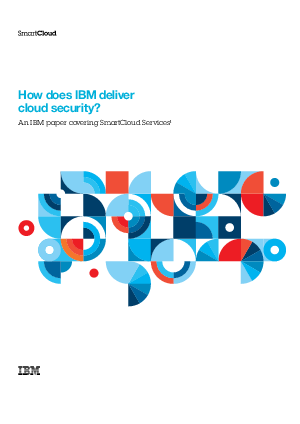 > Research Library > IBM > How Does IBM Deliver Cloud Security? How Does IBM Deliver Cloud Security? Cloud computing is changing the way we use computing and has the potential for significant economic and efficiency benefits. But the speed of adoption depends on how quickly trust in new cloud models can be established. Some of the growing cloud security concerns include: security of highly virtualised environments from targeted threats and attacks, enabling secure collaboration, protection of the data (isolation, sharing) in a rapid provisioning and de-provisioning environment while experiencing the loss of direct control of security compliance, and privacy parameters. In order to build this trust, IBM has written this paper to enable discussion around the new security challenges cloud introduces and how these are addressed by IBM’s cloud offerings. We highlight the approach IBM takes to secure cloud services delivered from IBM delivery centres. In delivering security for its cloud offerings, IBM looks to and relies upon its strong security heritage and expertise. IBM has more than 6,000 security engineers and consultants around the world, designing, building and running security solutions for its customers and helping them address their challenges in this space. It has a portfolio of more than 3,000 security patents, with 100 new patents in 2011 alone. IBM also has the largest vulnerability database in the industry and manages over 13 billion security related events every day for existing customers. IBM’s security strategy is based on the IBM Security Framework2, IBM provides security solutions that span this framework and works with organisations to take a holistic and risk-based approach to security. IBM has extensive experience of delivering in an outsourced and managed services environment and of having those services internally and externally audited to recognised industry standards. The approach IBM takes to delivering cloud services to its customers is anchored in the IBM Security Framework and the associated IBM Security Blueprint. By using this proven framework and blueprint approach, we have created a set of foundational controls specific to cloud. These Cloud Security Foundation Controls have been developed from the foundational security management layer of the blueprint and are used to communicate with customers, partners and other stakeholders about how we approach security in our cloud models.